I am a member of the Typewriter Generation. With pencil and ink, we stored information on paper and termed them “documents.” Not surprisingly, members of my generation tend to think of stored information in terms of tangible and authoritative things we persist in calling “documents.” But unlike use of the word “folder” to describe a data directory (despite the absence of any folded thing) or the quaint shutter click made by camera phones (despite the absence of shutters), couching requests for production as demands for documents is not harmless skeuomorphism. The outmoded thinking that electronically stored information items are just electronic paper documents makes e-discovery more difficult and costly. It’s a mindset that hampers legal professionals as they strive toward competence in e-discovery. Does clinging to the notion of “document” really hold us back? I think so, because continuing to define what we seek in discovery as “documents” ties us to a two-dimensional view of four-dimensional information. The first two dimensions of a “document” are its content, essentially what emerges when you print it to paper or an image format like TIFF. But, ESI always implicates a third dimension, metadata and embedded content, and sometimes a fourth, temporal dimension, as we often discover different versions of information items over time. The distinction becomes crucial when considering suitable forms of production and prompts a need to understand the concept of Fielding and Fielded Data, as well as recognize that preserving the fielded character of data is essential to preserving its utility and searchability. When I say data is “fielded,” I mean that information is stored in locations dedicated to holding just that information. Fielding data serves to separate and identify information so you can search, sort and cull using just that information. It’s a capability we take for granted in digital applications but that is often crippled or eradicated when data is produced in e-discovery. Fielding data isn’t new. We did it back when data was stored as paper documents. Take a typical law firm letter: the letterhead identifies the firm, the date below the letterhead is understood to be the date sent. A Re: line follows, denoting matter or subject, then the addressee, salutation, etc. The recipient is understood to be named at the start of the letter and the sender at the bottom. These conventions governing where to place information are vital to our ability to understand and organize conventional correspondence. Similarly, all of the common productivity file types encountered in e-discovery (Microsoft Office formats, PDF and e-mail) employ fielding to abet utility and functionality. Native “documents” are natively fielded; that is, a file’s content is structured to insure that particular pieces of information reside in defined locations within the file. This structure is understood and exploited by the native application and by tools designed to avail themselves of the file architecture. We act inconsistently, inefficiently and irrationally when we deal with fielded information in e-discovery. In contrast to just a few years ago, only the most Neanderthal counsel now challenges the need to produce the native fielding of spreadsheet data. Accordingly, production of spreadsheets in native forms has evolved to become routine and (largely) uncontentious. To get to this point, workflows were modified, Bates numbering procedures were tweaked, and despite dire predictions, none of it made the sky fall. We can and must do the same with PowerPoint presentations and Word documents. 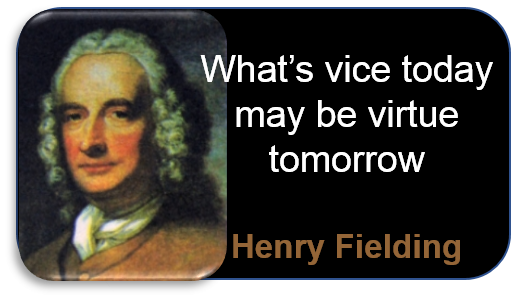 “What’s vice today may be virtue tomorrow,” wrote novelist (and jurist) Henry Fielding—and let’s give credit for the sentiment to another eloquent judge with insight into love, Justice Anthony Kennedy. Now, take e-mail. All e-mail is natively fielded data, and the architecture of e-mail messages is established by published standards called RFCs—structural conventions that e-mail applications and systems must embrace to insure that messages can traverse any server. The RFCs define placement and labeling of the sender, recipients, subject, date, attachments, routing, message body and other components of every e-mail that transits the Internet. But when we produce e-mail in discovery, the “accepted” practice is to deconstruct each message and produce it in a cruder fielded format that’s incompatible with the RFCs and unrecognizable to any e-mail tool or system. Too, the production is almost always incomplete compared to the native content. The deconstruction of fielded data is accomplished by a process called Field Mapping. The contents of particular fields within the native source are extracted and inserted into a matrix that may assign the same name to the field as accorded by the native application or rename it to something else altogether. Thus, the source data is “mapped’ to a new name and location. At all events, the mapped fields never mirror the field structure of the source file. The jumbled fielding doesn’t entirely destroy the ability to search within fields or cull and sort by fielded content; but, it requires lawyers to rent or buy tools that can re-assemble and read the restructured data in order to search, sort and review the content. And again, information in the original is often omitted, not because it’s privileged or sensitive, but because…well, um, er, we just do it that way, dammit! But the information that’s omitted, surely that’s useless metadata, right? Interestingly, no. In fact, the omitted information significantly aids our ability to make sense of the production, such as the fielded data that allows messages to be organized into conversational threads (e.g., In-Reply-To, References and Message-ID fields) and the fielded data that enables messages to be correctly ordered across time zones and daylight savings time (e.g., UTC offsets). The real answer is that counsel, and especially requesting counsel, are asleep at the wheel. Producing parties have been getting away with this nonsense, unchallenged, for so long, they’ve come to view it as a birthright. But, reform is coming, at the glacial pace for which we lawyers are justly reviled, I mean revered. 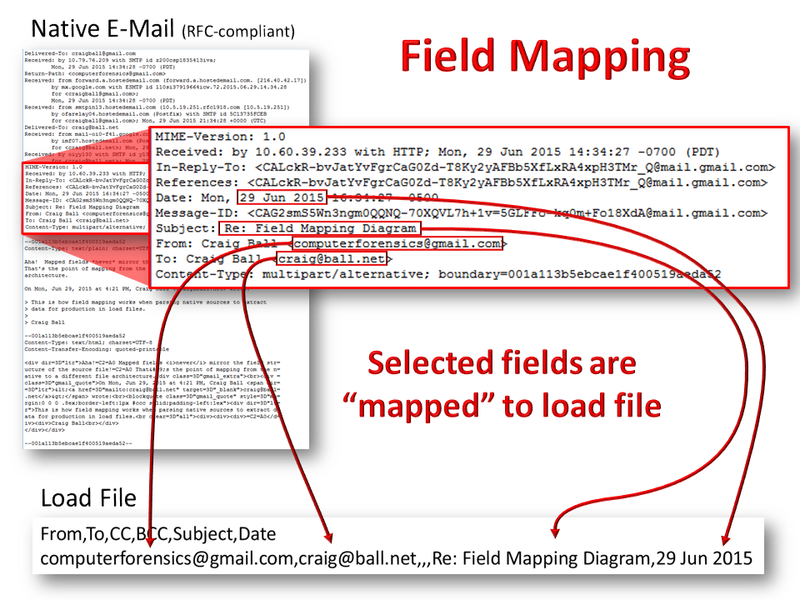 E-discovery standards have indeed evolved to acknowledge that e-mail must be supplied with some fielding preserved; but, there is no sound reason to produce e-mail with shuffled or omitted fields. It doesn’t cost more to be faithful to the native or near-native architecture or be complete in supplying fielded content; in fact, producing parties pay more to degrade the production, and what emerges costs more to review. Perhaps the hardest thing for lawyers and judges to appreciate is the importance fielding plays in culling, sorting and search. It’s efficient to be able to cull and sort files only by certain dates. It’s efficient to be able to search only within e-mail recipients. It’s efficient to be able to distinguish Speaker Notes within a PowerPoint or filter by the Author field in a Word document. Preserving the fielded character of data makes that possible. Preserving the fielded data and the native file architecture allows use of a broad array of tools against the data, where restructuring fielded data limits its use to only a handful of pricey tools that understand peculiar and proprietary production formats. It’s not enough for producing parties to respond, “But, you can reassemble the kit of data we produce to make it work somewhat like the original evidence.” In truth, you often can’t, and you shouldn’t have to try. Good point. A classification project comparing email content to meta data as a classifier is on my todo list. Did anyone else notice the “Carriage Return/Line Feed” at the very end of the post, and wonder – is this an intentional, possibly tongue-in-cheek message to the dinosaurs? “…searchability in discovery. Get the fielding right, and functionality follows. You caught me! Only a Typewriter Generation member in good standing is likely to have made the connection to what that meant. What does Justice Kennedy have do with file structure? I think Justice Kennedy’s contributions to file structure have more than equaled Henry Fielding’s, don’t you? It was an attaboy shout out of a different stripe–rainbow striped.